When they peer at distant galaxies, researchers are looking back in time. So to learn about the earliest years of the universe, scientists need to measure extremely faint and faraway star systems, whose light is often found in the infrared. 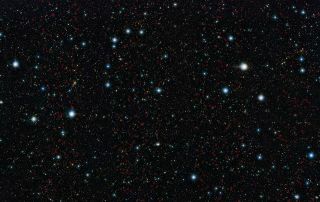 To focus in on the earliest massive galaxies and determine their age, the researchers combined data from the Spitzer Space Telescope, an orbiting infrared telescope, and the European Southern Observatory's Visible and Infrared Survey Telescope for Astronomy (VISTA) in Chile.